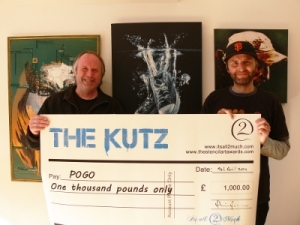 P0G0, winner of The Kutz 2015, visited our gallery to receive his prize of £1,000 from gallery owner Chris. You can still see the finalists entries on our special Kutz 2015 artist page here and photographs from the opening of the show here. The Kutz 2016 opened for entries on 31st March; you can see details of how to take part on our competition website www.thestencilartawards.com.